Sometime before noon on the 7th of September, four well mounted and well armed men approached Northfield from the north. They did not at once enter the town, but remained on that side of the bridge in the suburbs for the advance of the other division of the band, which came via Dundas, a small station on the line of the, railway about four miles south of Northfield. The brigands from Dundas were Cole and James Younger, Bill Chadwell and Clell Miller. On the north side were Frank and Jesse James, Charlie Pitts and Robert Younger. About 2 o'clock in the afternoon, Cole Younger and his party appeared, then the brigands rode into town and directly to the bank, the exact position of which had been before ascertained. Jesse and Frank James and Cole Younger dismounted and entered the bank. The brigands had entered the town at a full charge, shouting at the top of their voices and firing off their pistols as they rode. The inhabitants were taken by surprise, but were not at all panic-stricken. The movement on the bank was noted, and its object at once comprehended. The three leading brigands who had entered the bank proceeded to business at once. They sprang over the counter and confronted the surprised cash­ier, Mr. J. L. Haywood, with a huge knife, which they placed at his throat, and ordered him to open the safe, threatening him with instant death in case he refused. The knife had already marked his throat, but the brave cashier refused to comply with their demands. Again with fearful threats the command was repeated. 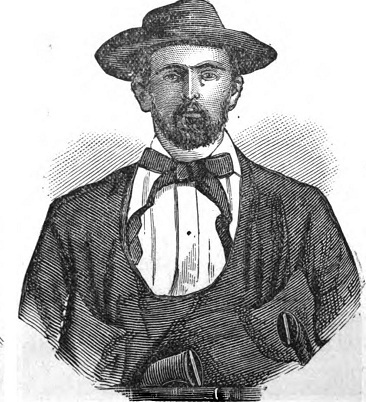 But Haywood still persisted in his refusal, when one of them, now generally believed to have been Jesse James, placed the muzzle of his pistol to Haywood's right temple, and fired. The cashier fell, and expired ere he had touched the floor. Besides the cashier, there were Mr. A. E. Bunker, assistant cashier, and Mr. Frank Wilcox, clerk. These were ordered to hold up their hands when the robbers first entered. Of course, under the circumstances, they could not do otherwise than to obey. After Haywood fell they turned to Mr. Bunker and ordered him to open the vault. That gentleman declared that he did not know the com­bination. Then they thrust a pistol into his face and made other threatening demonstrations. Mr. .Bunker, acting under an impulse to preserve his own life, fled out through the back door. As he ran, the robbers fired at him, the ball taking effect in his shoulder. They seem not to have paid any further attention to Mr. Wilcox, but occupied the remainder of the brief time allowed them in efforts to find the cashier's money drawer. The nickel drawer was found, and they scattered the contents of that over the floor. Meanwhile, an exciting scene was transpiring in the street in front of the bank building. A Mr. Wheeler, a young gentleman who occupied a sec­ond-story room in a building opposite, happened to possess a gun. Seizing this weapon, he took delib­erate aim and fired. The ball took effect, and Char­lie Pitts, a notorious Texas desperado, fell from his horse, shot through the heart. The shots fired by the brigands who had remained on the street did not have the desired effect in intimidating the citizens of Northfield. In a few moments many citizens who had seized guns and pistols, and whatever other weapons came in their way, were rushing toward the bank. Mr. Wheeler having been so successful in his first shot, fired a second time, and Bill Chadwell fell, mortally wounded, from his horse. By this time others were firing from windows, and one of the horses was struck and fell dead. Another horse which had been ridden by Charlie Pitts ran through the street. Another one of the band was struck by a bullet, but managed to keep his place. The situation was desperate. The leaders in the bank had not succeeded in getting anything, when the events happening in the street admonished them that their only salvation was in immediate flight. They rushed out of the bank, mounted their horses, and the six living bandits galloped away. Indeed, there was need that they should. Already a band of fifty citizens, well mounted and well-armed, were nearly ready to take the road in pursuit. At the head of this party rode Wheeler, who had already proved himself to be cool and daring. The flight of the discomfitted robbers was rapid. These free riders would never mount an inferior horse. But chances for escape were very few. The robbery, or rather, bold attempt at robbery, and es­pecially the death of Mr. Haywood, a gentleman held in the very highest esteem by the community at Northfield, had created a state of feeling in the pub­lic mind which would not allow the people to rest satisfied until the murderers were either captured or killed. In less than twenty-four hours the whole re­gion about was notified of the occurrence ac, North­field, and not less than four hundred well-armed and well mounted men were in hot pursuit of the six sur­viving brigands. The excitement occasioned by the events at Northfield was at fever heat. Efforts to capture the outlaws were further stimulated by the proclamation of Governor Pillsbury offering a reward of $1,000 for the apprehension of each of the robbers, or $6,000 for the capture of the survivors of the band. The bandits fled in a southwestern direction, toward the little hamlet of Shieldsville, situated about 20 miles on an airline, southwest from the scene of the tragedy at Northfield. The route taken by the rob­bers made the distance more than twenty-five miles; yet they were at Shieldsville before dark. They passed straight through the place and made no con­cealment of their identity. Shieldsville is a small post village, containing a population of no more than 175 souls. As they passed through the village, they shouted to the citizens who were on the streets to get into their houses, and they made such demonstrations by firing off their pistols that the people were greatly alarmed. The pursuers meanwhile were gathering about them: Sheriff Davis and posse were behind them; Sheriff Estes and posse were before them, and there were officers and armed citizens to the right and to the left of them. Their sit­uation became extremely critical after leaving Shieldsville. But the indomitable courage of the bandits seemed for a time, to promise them a final escape. From Shieldsville the bandits traveled in a west­erly direction toward Kilkenny, a post town and rail­way station in Le Sueur County. They were now avoiding the towns and travelled highways, and keeping in the forest, and travelling through the farms. All the crossing places on the streams were guarded by armed citizens. The guards at the ford on French creek became alarmed at the approach of the bandits and fled, so that they met no resistance at the crossing place. They remained one night for rest in a large forest near Kilkenny. The next morning they crossed the ford at Little Canyon. They pressed on toward the west. The route was beset with difficulties and dangers for them. They were anxious to reach the borderland, the frontier region, where men are few and wild. There was no rest for them. It was at length necessary for them to abandon their horses. They had camped in the depths of a great forest. The officials had taken to the by-paths and scoured the woods in search of them. Leaving their horses and some of their heavier clothing, they trudged on foot, skulking among the thickets. Their progress was slow. One day they camped on a sort of a penin­sula, about half a mile from a church. They were now thoroughly exhausted. Their diet had been green corn, potatoes and watermelons for several days, and they had been constantly on the move. Here a stray calf came along and they shot it in the head, but the calf did not fall, on the contrary, it ran away. A small pig passed by their camp, and one of them shot him in the head. But the pig refused to succumb, and ran away. After leaving their isolated camp in the evening, foot-sore and worn out by reason of the anxiety and fatigue, they pushed forward in a more southerly di­rection, leaving Cleveland and the forest where they had abandoned their horses to the right. At midnight they had reached Marysburg, a small post village in the southern part of Le Sueur County. Finding a convenient hiding place they kindled a fire, and had a meal of roasted potatoes and corn. The village clock struck six. They heard the bell and judged themselves to be about a mile from the town. They left the Marysburg camp somewhat refreshed, and with buoyant hope of an ultimate escape from impending peril. Thus far they had eluded their pur­suers. Their route from Marysburg lay southwest­ward through Blue Earth County, to Mankato. They made good headway during the day, and late in the evening they found a nice hiding place in a thicket in a cornfield, and lay very quiet without making a fire. Twice during the night they were alarmed by persons passing near them. Their hiding place happened to be near a neighborhood path which ran through the fields. Six days after the affair at Northfield, when the worn robbers were struggling along through a great forest near Shaubut's, a few miles in a northeasterly direction from Mankato, they came suddenly upon a man named Dunning, who was one of a posse of citizens in pursuit of them. They at once captured this man, and a question arose as to the course to be taken with him. At once it was suggested by some one of the band to bind him fast to a tree and so leave him. Dunning pleaded hard for his life, and to be spared the terrible ordeal of such an uncer­tainty as that of being left bound in that great forest. It might be days before he would be discovered, and it might be that no human being would pass that way until he would be starved. Finally, from motives of humanity, as they claim, they administered to Dun­ning the most terrible oaths that he would not say one word about having seen them until they had ample time allowed to get out of the country alto­gether. Dunning gladly consented to take upon himself these solemn obligations, and they let him go. The released citizen sought the haunts of men and made haste to communicate to others all the particulars of his adventure with the robbers in the woods; and then the pursuit was renewed with new ardor and zeal. At midnight, six days after North­field, the weary bandits trudged through Mankato in a very different plight from that in which they had made their entry into the place but a little more than a week before. As they approached the town with which they had made themselves familiar as they went to Northfield, they were alarmed by the shrill whistle of the oil mill. They concluded that their approach had been noted, and the steam whistle was the signal agreed upon to call the citizens together in case the approach of the robbers was noted. They therefore turned aside from the main streets, and sought the lanes and alleys back of the oil-mill. Here they hid awhile, but as there did not seem to be any move­ment among the citizens, they stealthily passed on, across the bridge. The guards had retired, or were not disposed to attack the six desperadoes. At any rate, they were not interrupted. After crossing, they raided a field of watermelons, selected four large ones, and under the deep shade of the trees, at the hour of one o'clock, they had a feast on the melons. They visited a house nearby and got one spring chicken, and would have secured more had time been allowed. But they heard a great shouting of people, and saw one man looking for tracks. They fled at once up a bank, and pushed forward through the woods bordering the Blue Earth River. During the day they crossed that stream. It was on the day after they passed Mankato that Frank and Jesse James, who appeared to have suf­fered less from the fatigue and exposure than the others, bid a last adieu to their comrades in the ill-starred Northfield enterprise. Only Cole Younger and his brothers, Jim and Bob, and Clell Miller, were left. The pursuers struck the trail of the James’s, and these desperadoes now had a terrible time in eluding those who sought them. They were repeatedly fired upon, and were both wounded severely several times. The four men left in the Blue Earth River forest struggled on toward the west. They had passed through the county of Blue Earth, and entered Watonwan County, full seventy-five miles on a straight line from Northfield, and a hundred and twenty-five miles by the route they had travelled. They had reached the swamps bordering the Watonwan River. They had been now exposed to untold hardships from the afternoon of the 7th of September to the 21st of the same month, a period of fourteen days. They had subsisted on green corn, potatoes and melons for the most part during that whole time. They had had but little sleep, and had been con­stantly harassed by their pursuers. For nine days and nights they had been compelled to walk through forests and thickets, and their clothes had been lit­erally picked from their bodies by the thorns and brambles through which they had struggled. Their feet were in a most terrible condition. But their pursuers still followed them with a grim resolve that nothing could equal. 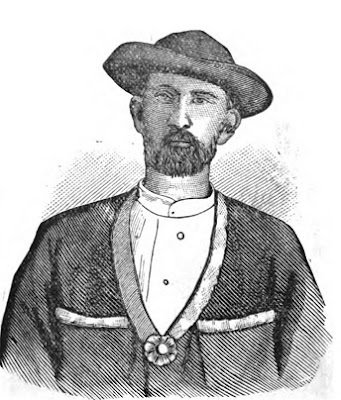 On the afternoon of the 21st, Sheriff McDonald, of Sioux City, having tracked the brigands to a swamp a few miles from Madelia, the county seat of Watonwan County, Minnesota, the final struggle commenced. The sheriff's forces had surrounded the swamp where the brigands lay concealed. The armed citizens then began to close in upon the sur­rounded men, keeping up a continuous fire as they advanced. The bandits were not the men to yield, even to a superior force, without making a desper­ate resistance. One of the sheriff's men was severely and another was slightly wounded as they closed in upon the wearied but still determined men. The continuous volleys poured into the thicket where the bandits had concealed themselves were not without effect. First, Clell Miller fell, moaned once, and then his lips became mute forever. A heavy rifle ball then crashed through Jim Younger's jaw, shattering the lower jawbone in a most frightful manner. Cole Younger received seven wounds, and Bob was shot in the right elbow. They fought desperately, but what could four men do? Sheriff McDonald com­manded a hundred and fifty courageous men, whose lives had been spent on the frontiers. Resistance could no longer be offered, when one of their num­ber had fallen, and the other three were wounded, two of them nigh unto death. It was the last strug­gle of four as daring and dangerous men as ever rode over the Western prairies. When resistance had ceased, the sheriff's men gathered around them. They were prisoners; their last hour of freedom had expired. They were placed in spring-wagons and carried into Madelia. The people of the whole sur­rounding regions came flocking into the town to see the renowned outlaws, for they had confessed that they were the Younger Brothers, whose fame as dar­ing free-booters had already been extended over the entire country. In a few days the wounded robbers—Cole, Jim and Bob Younger—were carried to Faribault, the county seat of Rice county. They were closely guarded, as well to prevent excited citizens taking the law into their own hands as to insure the safe custody of the bandits. The body of Clell Miller was conveyed to St. Paul to be embalmed. While confined at Faribault, the Youngers re­ceived every attention, and rapidly recovered from the effects of their long exposure and the terrible wounds which they had received. During this time a strong guard was maintained about their prison. Early in October, the Rice County Circuit Court met at Faribault, and Thomas Coleman, James and Robert Ewing Younger were arraigned at the bar to plead to an indictment for murder in the first degree, and for conspiring to commit murder and robbery. Advised by counsel that under the laws of the state the death penalty could not be inflicted in cases when the parties charged entered the plea of guilty, the three brothers plead guilty, and were sentenced to the penitentiary at Stillwater for the terms of their natural lives. A few days afterward they were re­moved to their life-time place of abode, and the stormy career of the Youngers closed. Since their incarceration, it is understood that Jim Younger has died. Cole and Bob, in their dreary isolation, still survive, without hope of breathing the air of freedom again. The most formidable band of robbers in this country had suffered terribly in consequence of the raid on Northfield. Charlie Pitts, Bill Chadwell and Clell Miller—the last-named a formidable law­breaker, who was raised in Clay County—had lost their lives. Cole, Jim and Bob Younger had been captured. Jesse and Frank James were still free, but numerous officers of the law were on their trail. When the James’s left the. Youngers in the Blue Earth river bottom, they were on foot. The Young­ers and Miller had entrusted to them their watches and jewelry and most of their money, believing that there was a possibility for the James’s to escape. The departure of Frank and Jesse created a diver­sion in favor of the Youngers and Miller. The bands of armed citizens followed the James’s. For two days and nights the brothers travelled west­ward, their footsteps constantly dogged by wary citizens. The hardships through which they were passing were almost incredible. The men were sometimes almost completely surrounded by the citizens. Three days after they had separated from their comrades, they came to a wilderness region, where the timber was heavy and the underbrush thick. Here they proposed to rest for a season. But they were tracked to their hiding place, and fired upon by a band of pursuers. Frank James received a wound in the hip. The brush was so thick that the pursuers, who were on horseback, could make no headway, and three of them dismounted to continue the chase on foot. The direction taken by the hunted men led to a swamp, but the season being dry, there was but little mud in the basin. The bushes were close together, and aquatic plants were high. The three men seemed resolved to close up with them. Several times the hunted bandits could have killed the citizens, but for the fact that their ammunition was giving out, and they desired to take care of what remained for the last emergency. It was getting late; the sun was low in the west, and the shadows were deepening in the forest. The three pursuers were determinedly following them. Once or twice the hunted men were tempted to turn and try the issues with their foes. But they kept on. Just when daylight faded away, they emerged from the swamp, and found themselves in a traveled highway. They had lost their determined foes in the darkness of the sombre swamp behind them. They started down the road, which lay along the bank of a stream of considera­ble size. Wearied into a state of exhaustion, they hoped to find a snug place where they could rest and take some food. But their trials were not yet at an end. In the lonely depths of the forest, with the dark, still river on one side, and the timbered wilder­ness on the other, they heard the ominous sounds of horses' hoofs. They listened. There were horsemen behind and before them. In another moment, sounds came from the woods, which indicated that they were being surrounded. The wearied freebooters quickly stepped into the deep shadow of a great tree which stood upon the bank of the stream, to await further developments. That the horsemen were gradually closing around them they were speedily convinced. Their situation was critical. What could be done? The stream be­low them was evidently deep and dangerous to ford. Their plans were quickly formed and consummated. They quietly dropped down the bank to the margin of the stream, which at that place flowed close by an abrupt bank. "They were there by that tree but a moment ago," they heard one man remark, as a party came up to the spot where the outlaws had stood but a moment before. It was evident that their numbers must exceed twenty. Stealthily the hunted brothers moved down the stream along the margin of the water, and close up under the overhanging bank. They heard their pursuers dis­cuss the situation. "They are still near at hand, no doubt," the brothers heard one remark. Then the movements indicated that they were preparing for a more careful examination of the situation where they were. Soon several men came riding down the road just over their heads. They had reached a place where the river runs under a shelving bank and the brothers could go no further without taking to the water. Four men came down the bank above, and came toward them. The brothers were constrained to take to the stream. The water was about two feet deep. They clung close to the bank, and silently reached a place they deemed safe, in a cave-like excavation made by the water under the roots of a great tree. The hunters came to the place where the bank and the waters met, and, ap­parently satisfied, they turned and went back. The brothers heard the clash of horses' feet on a bridge below, and then they knew that the crossing below was guarded. After a time all became still around them. They concluded to swim or wade the river from the point where they were, and, once on the opposite side, to strike through the country. Silently as possible, without any splashing, they came from their place of concealment and waded out into the stream until they were compelled to swim. The night was quite dark, and they passed over without being discovered. Climbing the oppo­site bank, they found themselves in an open wood. With all the haste which they could make, they pro­ceeded westward. A mile away they came to a cornfield, and in the field there was a thicket. Here they found a hiding-place, and, as wet as they were, they partook of a repast of green corn, and lying down on the grass, they slept soundly until the sun was up. Waiting some time in a sunny place until their clothing had partly dried, the brothers started on their weary way. All day they travelled without being molested. In the evening, while travelling along a country road, they met a man leading two horses, one of which was saddled. They spoke to him, and from his manner and the answers he made them, they were convinced that he had not heard anything about the affair at Northfield. They asked him if he would like to sell the horses he was lead­ing. He answered that it was his business to deal in horse-flesh. What would he take for the pair? The man named the price, and, after some banter­ing, a trade was effected, and even the saddle on which he rode was transferred, the horse-trader de­claring that he did not own anything which he would not sell. Jesse and Frank James were once more mounted. They stopped at a cabin in a lonely locality and asked for supper. A woman and two children were apparently the only inmates. They learned from her that her husband had been summoned to help catch a gang of horse-thieves, and had not been home for three days. Frank carefully concealed his wound, and the woman quickly prepared a good supper for them, and, after settling with her, they mounted and rode away. The brothers rode all night, and as their horses were fresh and good travelers, they traversed many miles. They had already begun to congratulate themselves on their escape, when one day when they were in the neighborhood of a town on the western border of Iowa, they were fiercely attacked by seven men, all well-armed, but, fortunately for the outlaw brothers, not very well mounted. A running fight ensued, and Frank received a desperate wound. But the good fortune which had so often attended them came to their aid, and in the darkness of the night they rode far away, and in the morning reached a house where the services of a physician were se­cured, who dressed Frank's wounds. The physician was afterward arrested, but no evidence of his hav­ing knowledge of the character of his patient was produced, and he was discharged. The brothers had reached the borders of Nebraska. Jesse had a "friend" somewhere on the confines of that state, and they proceeded to his place by easy stages. Here they rested for some days while Frank's wounds were attended to by a physician. But the news of Northfield had reached there, and suspicions of their friend and his strange guests were aroused. It was deemed best to take an early departure. An ambulance was procured. One of the horses was disposed of, and the boys by easy stages drove into Kansas. Their horse and ambu­lance was disposed of there. At a station not a thousand miles west of Kansas City they took the cars, and were transported to Texas. At Waco, Frank was placed under the care of a physician, and nursed until restored to health again. Thus was terminated one of the most remarkable escapes from capture ever recorded. None other than men of very superior genius could have suc­ceeded. As it is, the exploit is one of marvelous adroitness, one which cannot fail to excite our admiration.